Throwback Thursday: Halloween 1984, with "Stranger Things 2" from Netflix. It's almost time to return to the world of "Stranger Things" on Netflix, with the second season coming tomorrow, October 27th!! Let's not pretend like we haven't watched each trailer a dozen times, and skip the need to preview this season. We know what's up, right? 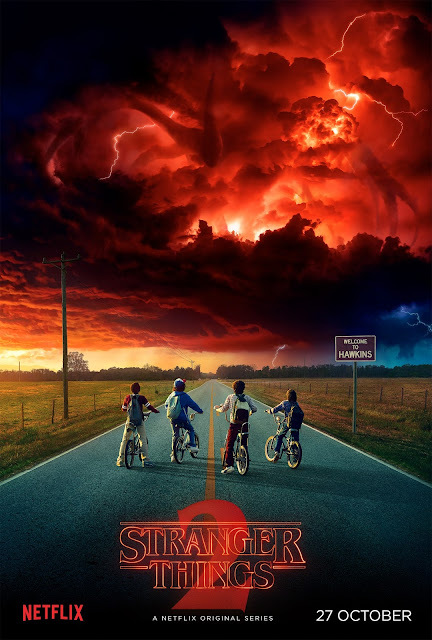 So I've decided to take a trip through time to see what would have been big in popular culture on Halloween of 1984, when "Stranger Things 2" is set. Sitting pretty on top of the Billboard Hot 100 in the States for the third straight week was the Stevie Wonder classic "I Just Called to Say I Love You". Meanwhile, here in Ireland, Wham! were on their own three-week run of topping the chart with their hit single "Freedom". Hi, I'm back, and yes I know it has been awhile. I took a big break there which was truly needed for a few months, but now I'm itching to get back to writing and reviewing. I didn't give up on makeup during my time off and came across some gems along the way. I was sent some Sigma products and I have to say I'm impressed. It's a brand that went under my radar for awhile but now that I've had the opportunity to discover their products I will be bringing you my thoughts over the coming weeks. Autumn is here and that usually means I have red lipstick out and ready to be worn. The Sigma Power Stick in the shade Bloody-Good was completely new to me and one that I have been enjoying.